As we make our way through the current season of Fortnite, we're finding that the Fortnite Pirate Camps are increasingly becoming a part of the various challenges available - as well as still being a handy source of Fortnite cannons, Fortnite Baller vehicles, loot, and ammo, of course! These ramshackle buildings are fairly easy to spot when you're nearby, but you still need to know which areas to look in. As well as being integral to several of the Fortnite Battle Pass Challenges, which require you to both visit every Pirate Camp and eliminate three opponents at them, the new Fortnite Buccaneer's Bounty Challenges also task you with visiting a Pirate Camp in ten different matches. To help you out with these, we've got the details on where to find all seven of the Fortnite Pirate Camps, so if you're working on any of those challenges we've got you covered. There are seven Pirate Camps on the map, which look like normal structures that have been build on top of. The key thing to look out for are the pirate flags flying from the roof - it's a dead giveaway! Head to Lazy Lagoon at the top, middle of the map and you'll find a Pirate Camp to the west of the ship on a small hill. The old abandoned house near Haunted Hills and Pleasant Park has found a new purpose in life as a slightly spooky looking Pirate Camp in Season 8. On the northwestern edge of Dusty Divot, you'll find a Pirate Camp near the hill. On the western side of the lava spewing hole in the volcano you'll find a Pirate Camp on the scorched sides of the mountain. Southwest of Tilted Towers, you'll find a Pirate Camp in the snow. 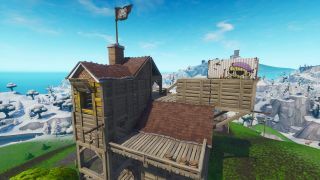 Head for the big hill southwest of Salty Springs, and you'll find a Pirate Camp on top of it just before the snow. Just as the sands starts for Paradise Palms, you'll find a Pirate Camp by the broken bridge at H7. Looking for more challenge help? Then here's where to search where the magnifying glass sits on the Treasure Map loading screen in Fortnite.